but the just man, like a lion, feels sure of himself. There is a deep reality about the inner life at the center of this proverb: our fears are not about punishment or penalty, even when our minds return to that possibility constantly. Our minds are pointing us to something deeper. “The wicked” are never fully identified in Proverbs; they are not defined by particular actions. We do know that they are selfish; their first thought or action is to get their own way. Centered on their desires, all those around them – and God – become enemies who might stand between them and the fulfillment of their wishes. While they seem to have everything they want, they are vulnerable to losing it at any moment. At a deeper level, they know that they were made for relationship with God, whose gaze of love they can feel in their inmost being. In the spiritual plane, this is the source of much serious anxiety. We worry over a variety of concrete problems, but feel relief when we come up with a plan of action. Others feel a deep anxiety that goes beyond one or another problem in their lives. None of their actions bring them calm. They run away, figuratively in games and entertainment and frantic activity or by changing jobs, friends, homes, even families. They flee when no one pursues. Unfortunately, “the wicked” are not a class of people who have cornered the market for selfishness. Each of us, for a shorter or longer time, has been one of the wicked. We know what we are called to do, the right choice – but we choose against it. From that moment on, our uneasy conscience weighs us down, and we do anything to get out from underneath. The just man – the one who is centered on God – is described as sure of himself. 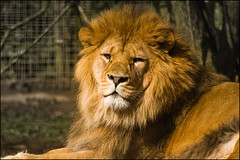 He can count on himself – as a lion cn – because he knows the source and extent of his strength. The bonds of community strengthen him as well as constrain him; God’s commandments written in his heart guide his actions and choices. His certainty is, paradoxically, not grounded in strength to get what he wants for himself, but confidence in working with God and with the human family. but he who walks in wisdom is safe. Previous Texting while … flying?? ?